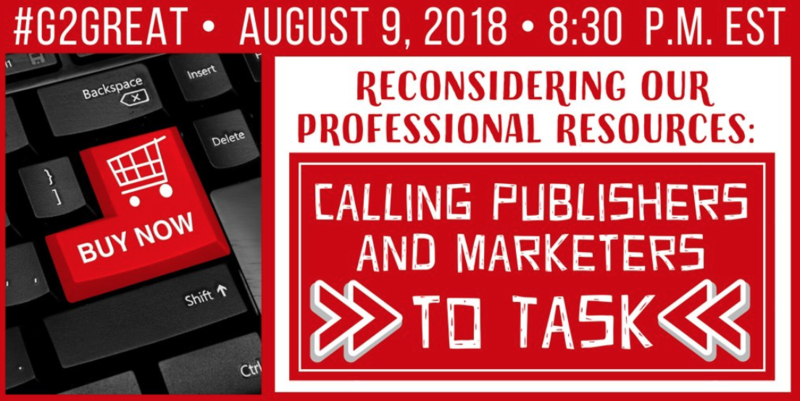 On Thursday, August 9, 2018 members of #G2Great’s PLN had an important conversation, Reconsidering Our Professional Resources: Calling Publishers and Marketers to Task. We’ve all seen them, those glossy brochures promising student success so long as “their plan of action” is followed with fidelity. Nonsense! This is what I know for sure, success begins by believing in teachers. Smart, resilient, talented teachers; these are the professionals who have the power to make a meaningful impact. 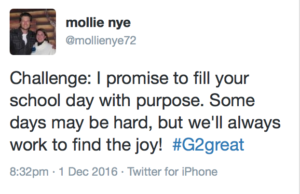 This blog as well as our weekly #G2Great chat exist to extend a platform that amplifies teacher voice. What was the message we sent out to the publishing world? Undoubtedly, there is an unlimited array of resource options at our disposal. Consumer choice is great and yet it can also be overwhelming. Boxed programs offer solutions but the truth is we have to think outside the box! 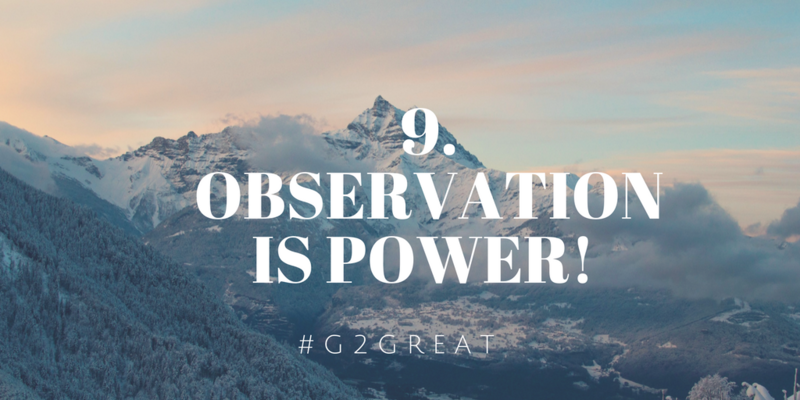 Taking a more expansive view includes gathering the perspective and wisdom of other educators. There are are more opportunities to exercise personal agency than ever before, social media has given us access to each other. Now we can grow our Professional Learning Networks (PLN). We can support professional organizations nationally and locally. We can be ambassadors for professional learning. Educating children is complex, so when a publisher or marketer, offers rigid solutions we need to get out the yellow caution tape, the orange cones, and flashing red lights because this is a professional danger zone. We need to do our own research on their research! We need to gather an array of formative assessments to look at how our students are performing inside our classrooms so we can inform any outside purchases. The most important thing to remember is to trust that we are the experts when it comes to our students. Once we know them, we know what resources we need to look for to inform our practice. A dynamic faculty is more than having good teachers and administrators. A dynamic faculty has a shared vision. Once you have a vision making decisions about professional resources becomes easier. Two tweets stood out to me because they both speak to identity and vision. Roman (@NowakRo) knows himself he is a reflective educator who values design thinking and collaborative work. Gravity (@drgravitygLLC) is a an author / researcher but I suspect the title she likes the most is… teacher who builds teams for collaborative work and shared vision. Know who you are, articulate what you value, and collaborate this needs to happen prior to purchasing anything. What does your curriculum ask of you? Curriculum that is a living document, that is informed by real practice, requires more from us. A go-to professional resource that maximizes the quality of teacher practices has to be relevant to decision making for day-to-day teaching. When research teams like those from Teachers College Reading Writing Project (@TCRWP) create resources you can be assured they are vetted in the field. The work they recommend is born from their think tank and is work they are actually doing so it will be relevant. This kind of work is constantly changing and growing because it keeps pace with teacher learning and discovery. It is imperative to initiate collective conversations before money exchanges hands for professional resources because if we don’t listen to the stakeholders there will be no ownership. If there is no ownership initiatives will fail. Collective conversations are always at the heart of growth, and I think this is the best way to begin the design process for supporting a child-centered perspective. Authenticity is the antidote to basal programs and scripts Authenticity can be realized when teachers have ownership over what they will learn and when schools invest in teacher education and learning. We are not so very different from our students. we are all at different points in our understanding for literacy instruction. As a result we all have different needs and our ongoing education education needs to match wherever we are in that continuum. So long as our learning rests squarely on students and their developing literacy learning we can’t go wrong. We are living in the 21st Century of course technology has an important place in the classroom. However, it can be misused as electronic worksheets. It should be our goal to enhance our practice through technology; while being careful that it does not substitute or diminish excellent teaching. For one thing, teachers not tools make the decisions. For another, accessing print resources and digital texts to build rich classroom libraries is an imperative. Students, teachers, and texts are the heart of the classroom. It’s ironic that we are asked time and time again to look for answers outside of the classroom when what is really needed is to take a closer look inside our classrooms. When we asked teachers what they need, they told us. 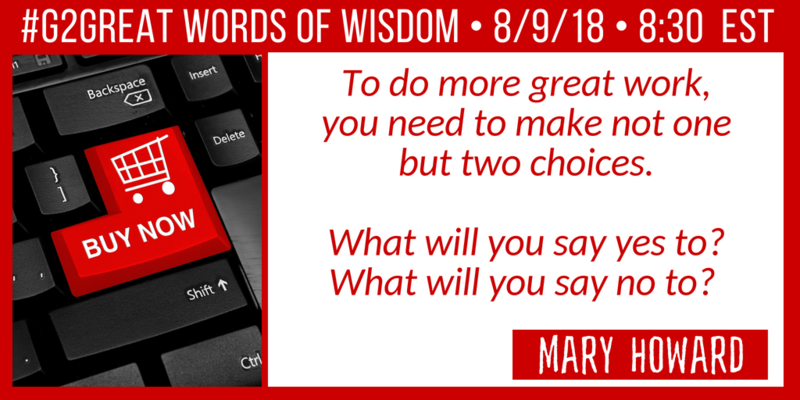 In the end, I think Mary said it best, “To do more great work, you need to make not one but two choices. What will you say yes to? 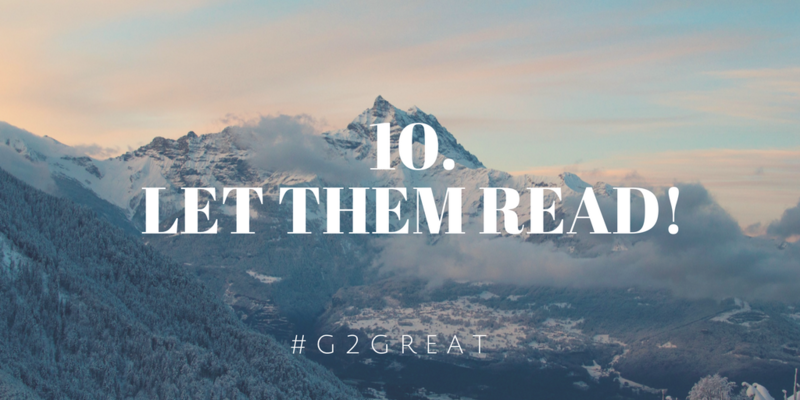 What will you say no to?” Good to Great Teaching Focusing on the Literacy Work That Matters. This is how we really put publishers to task so we may keep our students where they belong, at the center. 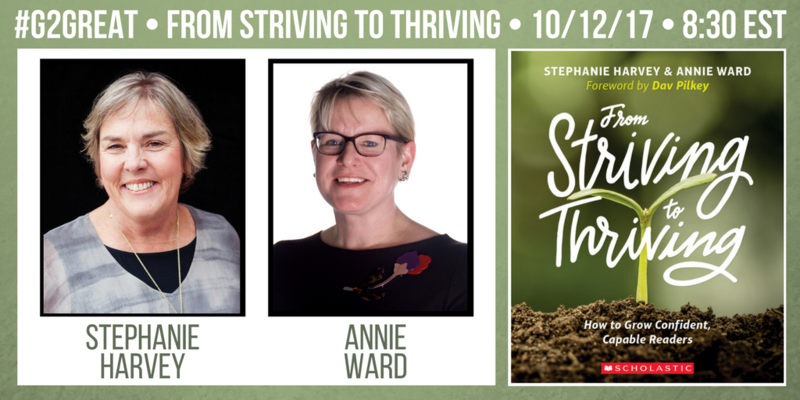 On 10/12/17 #G2Great was delighted to welcome Stephanie Harvey and Annie Ward to our guest host seat of honor. 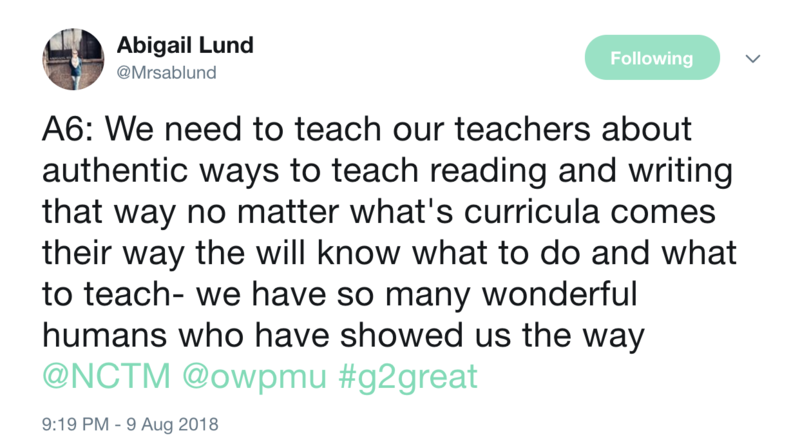 As soon as we said our first “hello friends,” our dedicated #G2Great family of learners enthusiastically joined forces Twitter style as we collectively savored the message of their exquisite new book: From Striving to Thriving: How to Grow Confident, Capable Readers (Scholastic, 2017). The words transformative joy and power of reading reached out and grabbed me by the heartstrings, holding me captive until I turned to the last page of the book. As I read, I was struck by the idea that I was experiencing this ‘transformative joy and power of reading’ from a professional perspective and I knew that this sense of elation was precisely what our children deserve. 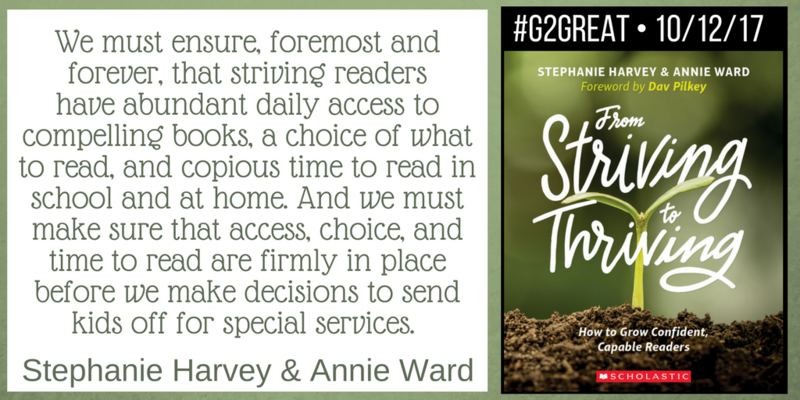 Stephanie and Annie draw a line in the proverbial sand as they take a clear stance on the powerful role books play for our striving readers. They highlight the critical goal of increasing the volume of reading within a rich environment filled with books. They ask us to engage in ‘relentless book matching’ so that we can get just right book into the hands of the children driven by the wild readerly abandon only choice can awaken. We recognize the impact of bathing children in books across the learning day and so we make room for joyful engaged independent reading because we view it is a professional priority rather than because we find extra minutes here and there. We make a time commitment to reading and expend our energy putting this into practice day after day. And we do this because we know that it matters deeply for our striving readers. Stephanie and Annie ask us to return comprehension to a place of honor as the “Super Power” that will spur readers forward. They do not trivialize the role that decoding plays as one component of the reading process but remind us that teaching comprehension under the umbrella of listening and viewing will build a foundation for decoding through understanding rather than isolated sounds. We do this from the earliest stages of learning by using daily read-aloud and beautiful picture books as words and images become our springboard to reading as a meaning-making event. We know that each component of reading has a place but we also recognize that information sound-bites are not meant to be the meaning-making sacrificial lamb. We do this because we know that it matters deeply for our striving readers. Stephanie and Annie ask us to approach reading in ways that will promote these experiences as an act of thinking rather than one of compliant doing. We know that this is only possible if we are willing to immerse children in books that will invite thinking and demonstrate this as we make what is invisible visible by sharing our own thinking publicly. We know that we can only celebrate “thinking-intensive’ reading opportunities by refuting the isolated tasks of thoughtless skill and drill and question interrogation so that we can opt for ample experiences that will engage children in the very reading opportunities that elicit the thinking we desire and children deserve. We do this because we know that it matters deeply for our striving readers. Stephanie and Annie acknowledge the power of collaborative talk and ask us to do the same. When we keep books at the center and marry them with experiences rooted in meaning and thinking, we set the stage for lifting the level of talk to the highest heights of teacher-supported and peer engagement. We use whole class dialogue to support this talk within an instructional context and then offer ample opportunities to apply this learning. We value conferring as a scaffold to support this transition to independence followed by a wide range of opportunities for students to engage in collaborative talk so that they can begin to take ownership of this process as we step to the sidelines. We lift their voices into the celebratory air while ensuring that conversations elevate reading rather than substitute for these experiences as we offer children the very real-life opportunities we hold dear. We do this because we know that it matters deeply for our striving readers. Stephanie and Annie emphasize assessment as a decision-making process that will lead us from where children are at this moment to next step efforts that will help them to grow. They ask us to make a shift from viewing reading as an isolated process of repeated assessments that rob teachers and children of the time we need to achieve each of the essential goals above. We know that this requires us to become expert kidwatchers who are present in the precious day-to-day learning opportunities that meet us at every turn. We use those experiences to inform our practices and illuminate next step efforts rather than numbers on a spreadsheet that cloud our view of the child in front of us. Above all, we view daily assessments from the lens of our responsibility to ensure the success of learners rather than to label them as a ‘struggling.’ We do this because we know that it matters deeply for our striving readers. Within the pages of their beautiful book and generous sharing on Twitter, Stephanie and Annie show us what is possible. Driven by a deep commitment to our striving learners, they remind us that it is our professional responsibility to support a journey from striving to thriving. They celebrate the potential impact when we make room in every day for the practices that will enrich the learning lives of children and inspire us to refute those things that will not. I believe that their wisdom could at long last inspire a shift in the intervention mentality that has plagued us. This much-needed refocusing could truly make from striving to thriving our new professional reality. And we are grateful to follow their lead! And that my friends, is a professional imperative! Now more than ever teachers need to be empowered, but it’s easier to find empowerment when you’ve got a friend at your side. 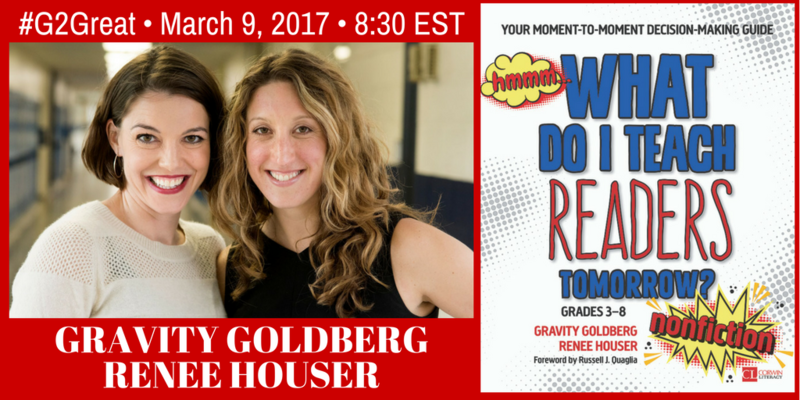 On March 9, 2017 #G2Great celebrated the partnership of Gravity Goldberg and Renee Houser and their incredible new books What Do I Teach Readers Tomorrow? NonFiction and newly released (click here) fiction edition. Jill and I believe deeply in the impact of partnerships because the key to empowerment begins when teachers work together. Through these collaborations, we can inspire, support, and challenge each other to grow as professionals. Partnerships help us to feel safe as we embrace the notion that it is good to step out of our comfort zones. 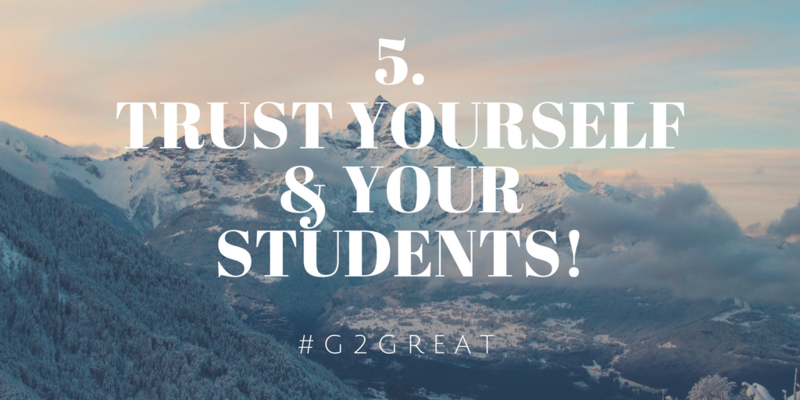 In doing so we yield greater rewards for ourselves and our students. 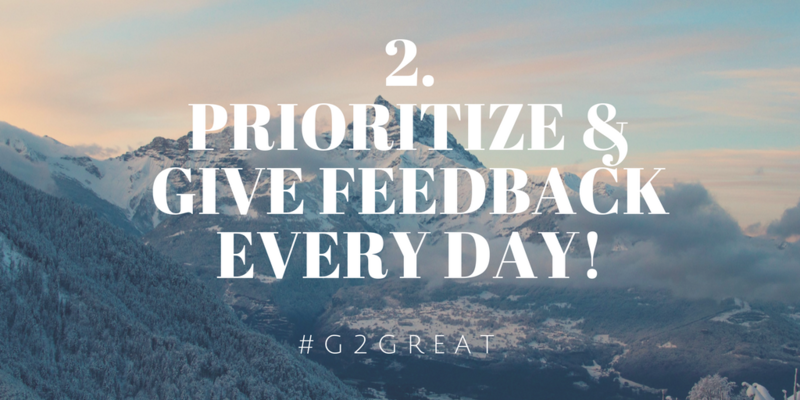 Every Thursday night we gather with our #G2Great PLN to learn together. This community is devoted to helping each other find our brave and push ourselves to be more responsive to the needs of our students. Decision-fatigue, the challenge teachers face in making a multitude of daily decisions, plagues us all so this question ignited a dynamic discussion! It turns out that making small tweaks can generate a big instructional impact within this process for teachers and students alike. This is just what so many of us needed to hear and what followed were some brilliant tweets! As we read through the tweets, we realized that many of us shared common beliefs – the seedlings for every great partnership! So we partnered your voices and through our G2Great collaboration we formed a supportive community where we could all appreciate advice that can empower what we teach tomorrow. You see, we are no longer separated by distance because we have a social media partnership where we can all lend our voices. We realized that these tweets were like the expert advice from colleagues. 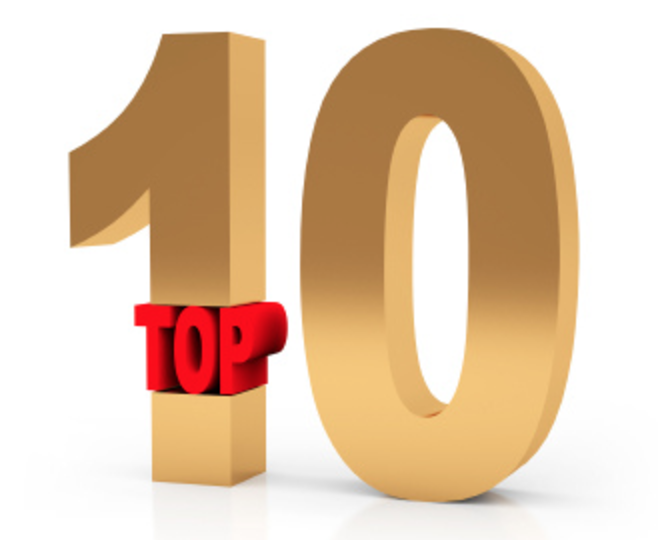 Using this expert advice, we generated A Top Ten Tips and Tweaks. If you are reading this blog, then you are already a teacher who is a learner at heart. We hope that our words bring you strength so you may leave here empowered to teach tomorrow. 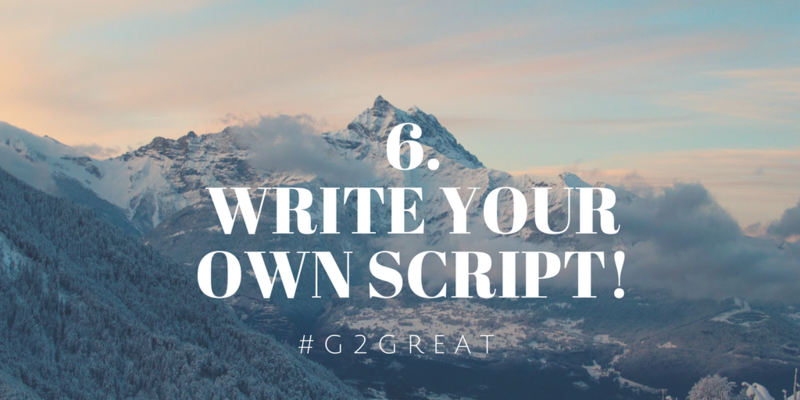 Success is just one small tweak away. Every day we make a ton of decisions some small, some huge. Our most important job is to help students feel empowered and capable to work on their own. This is true for us as well. Gravity and Renee wrote these books to inspire us. They believe in us and now we have our collective thinking to help us to believe in ourselves as well. Thank you Gravity & Renee! 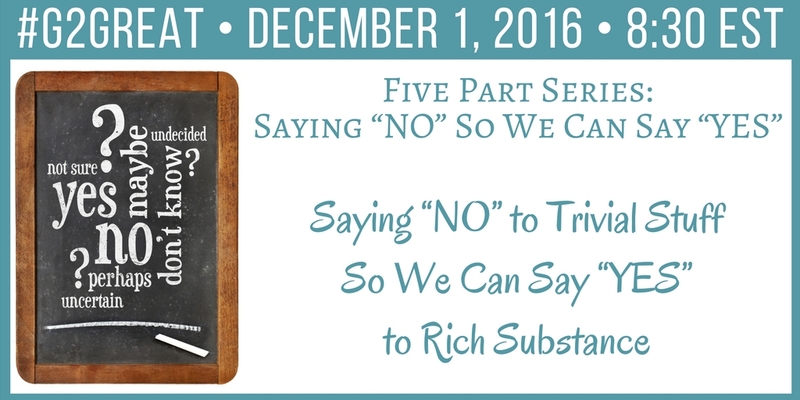 On December 1, 2016, #G2Great continued our five part series, Saying “No” So We Can Say “Yes” with our sights set squarely on alleviating the trivial stuff that usurps time for the rich substance students deserve. 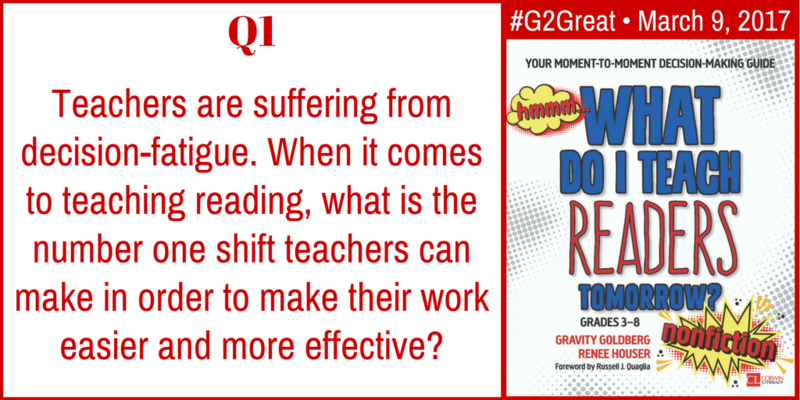 Our willingness to say “no” to the work that doesn’t matter so we can say “yes” to the work that does is the heart and soul of Good to Great Teaching, the book that inspired our #G2Great Twitter chat. Have you ever really listened intently to the sound of a ticking clock in an empty classroom? Well I have done that every day of my career so as an expert clock listener I can tell you that the sound reverberates loudly across the walls once we acknowledge that time is our most precious commodity. The stark realization that time is a gift that is utterly irreplaceable is a profound thought that should be at the forefront of our every move. Imagine if we were to leave a note in every nook and cranny of our classrooms that said simply, “Each minute is irreplaceable and if you choose to waste even one of them – you owe your students an apology.” (exactly what I wrote to myself). Teachers who say “yes” to rich substance view the wise expenditure of time as a serious responsibility, choosing to focus on what is most likely to have a positive and lingering impact on the lives of students. Teachers who say “yes” to rich substance are committed to making choices in the name of children, but this process of assuming professional responsibility does not happen by chance. We begin by identifying our deepest innermost beliefs about teaching and learning that will then form the values that guide those choices. Once we embrace our beliefs and values fully, they become part of who we are – ever present and inseparably intertwined with our words and actions. Regardless of the demands that will always vie for our attention, those beliefs and values are infused into every learning experience and somehow enrich even those we may not have chosen for ourselves. Our beliefs and values elevate our work because we know that it is not what we do that matters, but how we do those things in the most effective ways and always grounded in why we are doing them. 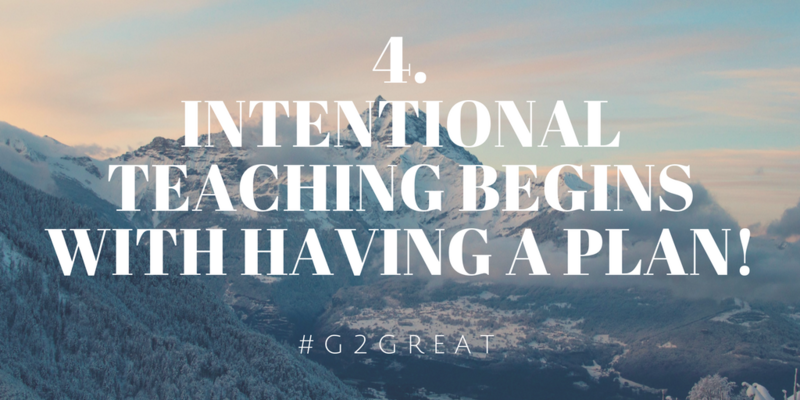 Teachers who say “yes” to rich substance know that great teaching is a process of uncertainty that often leads us in directions we could not possibly have imagined before the learning begins. Purpose guides us on a messy pathway to what is possible but it is the step-by-step journey along the way that has the potential to dramatically impact each of us. If we are willing to set the stage for discovery and trust children to lead the way as we wait in the wings to support their efforts – well it is quite something to behold because those are the lessons we will never forget. When we craft the learning opportunities that are designed to instill a sense of wonder, our role changes as children become our teachers. Within that zone of unknown where discovery resides, meaningful, purposeful, authentic learning fills the air with the low hum of joyful learning. And we are forever changed as a result! Teachers who say “yes” to rich substance hold tight to the practices that deserve a place of honor in every school day. While there will always be some things we cannot control, we can control what we choose to honor and refuse to relinquish regardless of competing demands. We do this by putting our non-negotaibles in the daily calendar, carved in professional stone so that nothing can replace them. We make them the center of our day because we know that we must fill each learning day with reading, writing and talking that will actively engage our students in enthusiastic learning. We don’t make excuses and we don’t covet anything that will force us to abandon those non-negotiables. Why? Because we are not willing to give up what we know matters most! Teachers who say “yes” to rich substance know that in order to have the joyful experiences our students deserve we must be willing to initiate honest and even difficult conversations. We do this because we know that this respectful discourse has tremendous potential to increase the likelihood that every educator in the building will move closer to saying “yes” to the work that matters. 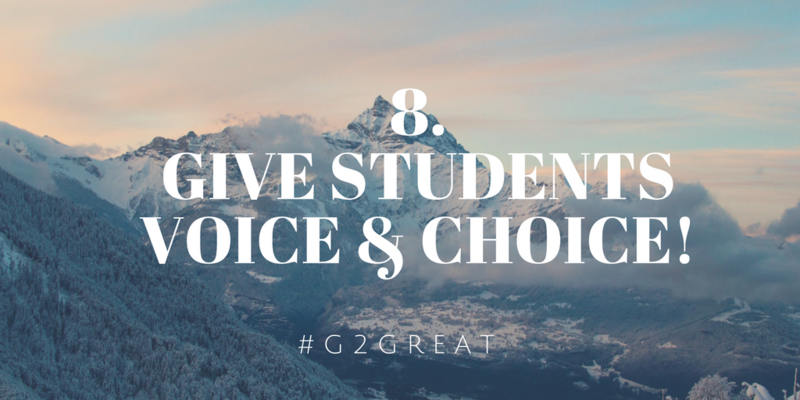 Although many of us suggested closing our doors to do this inspired work, our #G2Great dialogue helped us reconsider the impact of opening our doors to become a model for school wide change. If we believe every child deserves the best we have to offer then we must work together to spread this commitment across the building in any and every way that we can so that every child will have the richest opportunities. Teachers who say “yes” to rich substance know that we must always keep an eye to the future but that today is where we are needed now. We celebrate each moment as we consider how to provide the opportunities that students need at this point and time, yet knowing that our choices will impact children long after the day is done. We work to ensure that we offer the learning experiences our students need at that moment and time but always with our sights on how that may change on a day to day basis. We accomplish this by knowing each child and using that knowledge to create a learning day to meet their immediate needs while building upon those needs as new opportunities arise. We know each new day is another opportunity to provide the interconnected experiences that will have staying power. Teachers who say “yes” to rich substance make these hard choices because they know their students depend on them to do so. They have an unwavering dedication to each child and this dedication fills them with a resolute desire to make daily professional promises that know no boundaries. They refuse to be tethered to programs or scripts, willing instead to focus on the learning needs of their students as they hold tight to what matters. They do this because they are present in each learning moment and willing to use those moments as an instructional guide. They view children as a lesson plan waiting to be written, shifting their plans based on the child in front of them while always believing that every child can and will be successful. 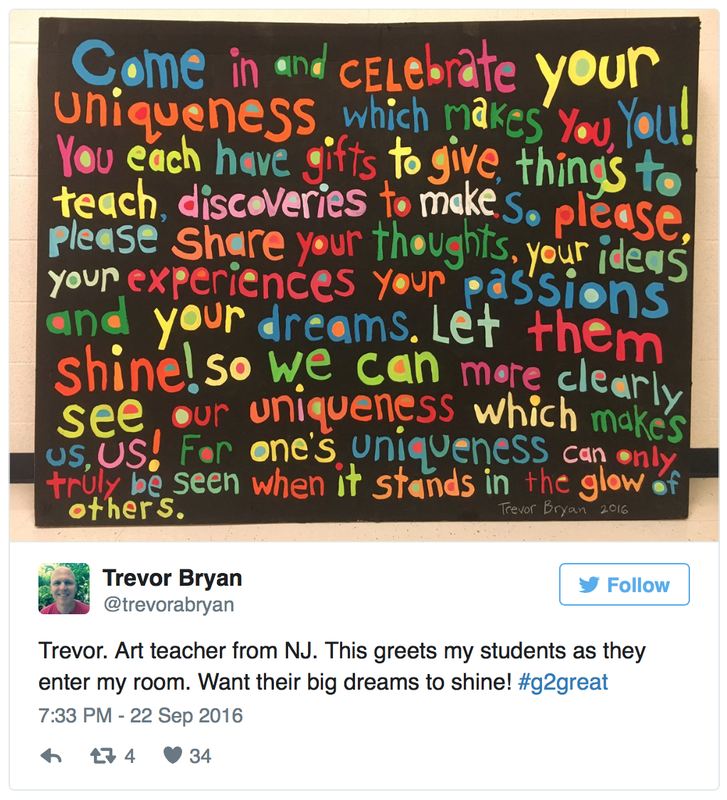 In closing, I want to express gratitude for incredible #G2Great educators who bring their passion for teaching day after day. Our commitment will forever lift us above the multitude of absurd mandates, directives and questionable programs ever-present on the educational horizon. Never lose faith that “No” is your stepping stone to “yes” and the antidote of roadblocks that cloud our view if we are willing to choose the one little word that will lead us upwards. We choose children over mandates. We choose children over directives. We choose children over programs. 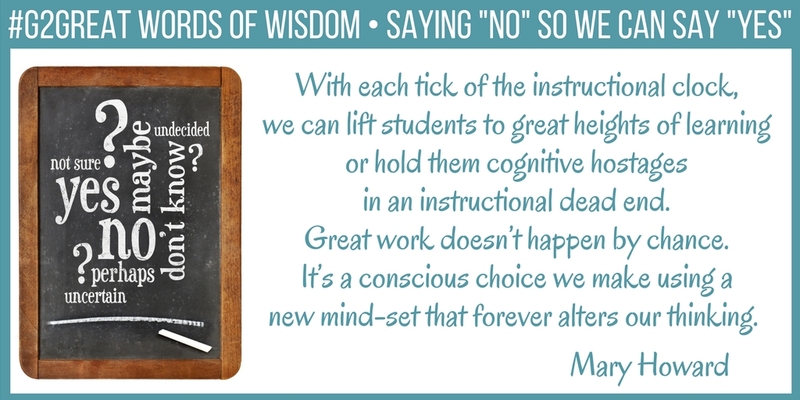 And we do this by saying “no” to the trivial stuff that alleviates precious time so that we can say “yes” to the rich substance that will leave a lasting imprint on the learning lives of children. In an age of uncertainty, we need more than ever to hold tight to the literacy work that matters! 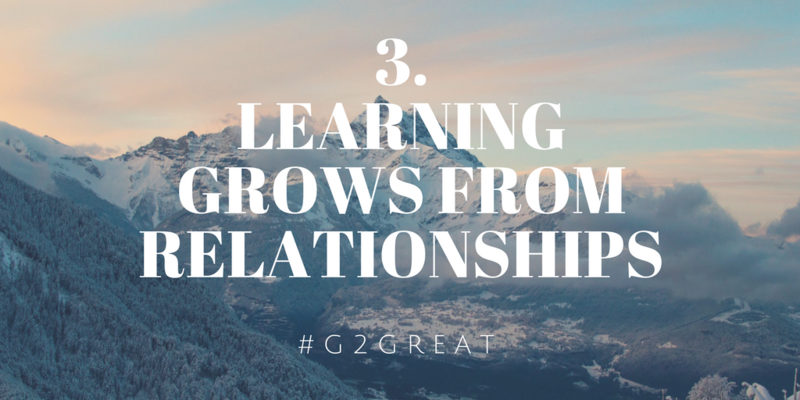 We are grateful for your unwavering commitment to children #G2great friends! 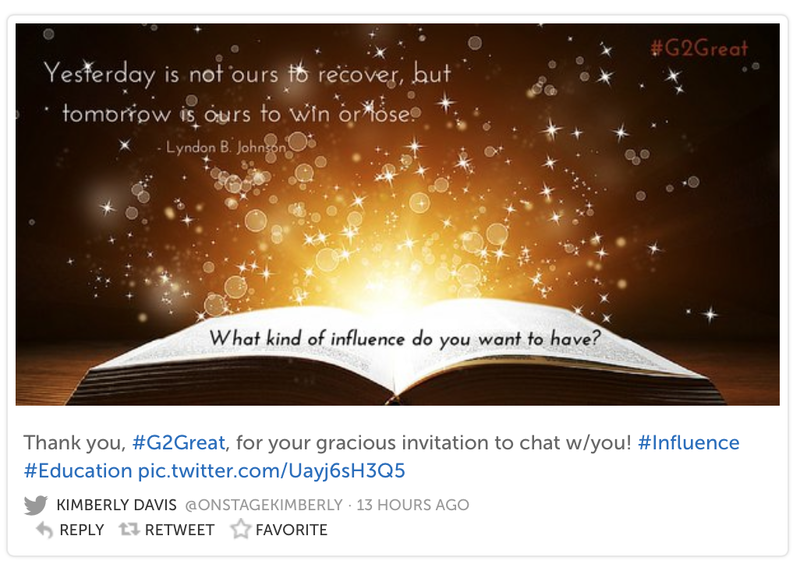 On 5/26/16, #G2Great guest host Kimberly Davis spread her light on Influence in Education: Leaving a Lasting Imprint. Kimberly first left her imprint of influence on 7/16/15 when she inspired our BRAVE based on her amazing TEDx Talk, What it means to be Brave. Kimberly brings wisdom, commitment and joy to her work as illustrated in a powerful episode with Alise Cortez, Bringing our True and Best Selves to Work. In fact, I am fortunate to have been touched by her influential friendship over the past year. 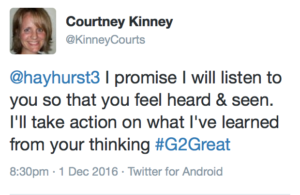 When I asked Kimberly about her #G2Great chat vision, she quickly expressed her desire to “stimulate teachers’ ability to influence through professional learning and self-discovery.” We can leave a lasting imprint of influence as we inspire or are inspired by others in positive ways. 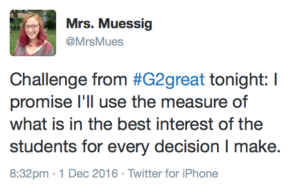 Certainly her goal was in part met by virtue of educators participating in our twitter chat. But how do we accomplish this even when we are surrounded by negativity? 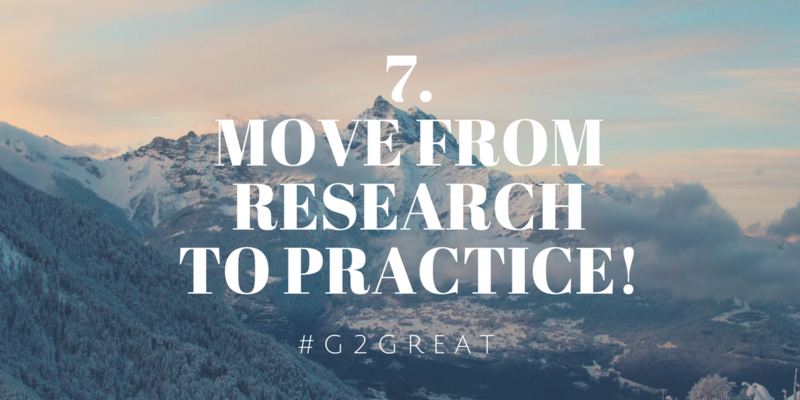 As we explored this question, our #G2Great family left a collective trail of influential imprints. Our purpose is grounded in the innermost beliefs that lead us to do great work each day in our own arena. These beliefs inform and inspire our purpose so that all we do contributes to those beliefs. Without purpose, our path will be littered with the ‘stuff’ that can blind us to influence imprints worth leaving. Our purpose as educators is centered squarely on the recipients of our efforts – students. We seek to understand so we can make decisions that will lift their learning lives, decisions that are inseparably intertwined with our beliefs. Our beliefs are always in our sights so believability (What IF) is transformed into BELIEF-ability (What IS), as our actions reflect that we can be trusted to make decisions based on the beliefs we purport to hold dear. But purpose grounded in our beliefs is only the beginning. In order for us to truly have positive impact, we must be willing to acknowledge and respond to the WANTS of others. 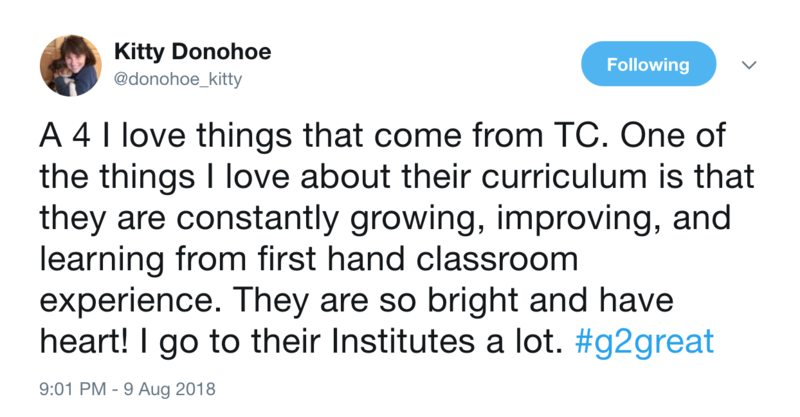 Our students’ wants begin with their desire to learn combined with unique needs they bring to the learning table (which varies from child to child). 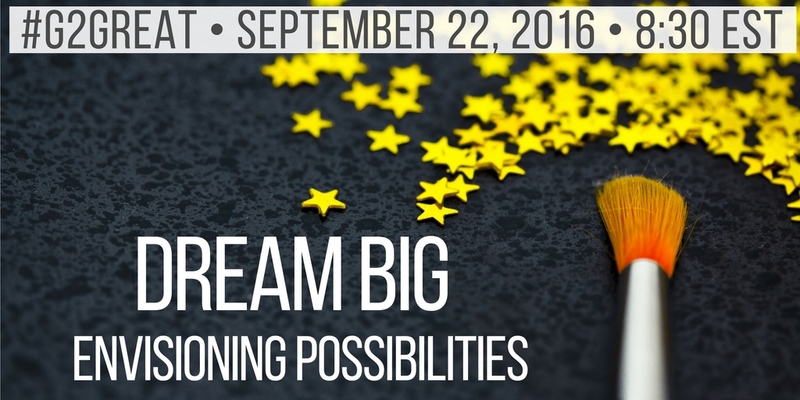 These wants amplify our determination to celebrate each child and honor their learning desires and needs. To do this, we set aside our professional agenda to make them our priority. We accomplish this goal by establishing relationships that help us to truly know students so that we can we tap into their WANTS at even greater levels. We believe every child desires and can achieve success and do all we can to help them become their best self in every possible way. We leave imprints of influence by assuming responsibility to meet their specific needs, refusing to be dissuaded by distractions that impede our efforts. Each child who walks into our classrooms brings more than their learning self to school – they also bring their lives outside our doors where they spend the bulk of their day. Understanding this life beyond the school day can help us create a bridge between home and school, a bridge that can strengthen our efforts from both perspectives. We are given a precious gift of time with students, but lasting imprints of influence come from creating this home-school connection. Building an instructional bridge of influence that follows them once they leave our care allows us to ‘step into shoes’ of parents and join forces with them to enrich and extend our efforts even if children are not with us. Understanding and respecting the “wants” of others is a courtesy we offer not only children but parents. Respect is earned and we earn respect when we afford are willing to afford others the same level of respect we desire. Respect is a two-way venture. We have all experienced a sense of professional loneliness even when surrounded by others. We can still leave lasting imprints in a lonely environment or when our words fall on deaf ears, but this is a challenging journey that can derail our efforts and rob us of the joys that enrich the experience. Yet if we are willing to take active steps to find our professional joy tribe of others who believe in our journey, we enter a celebratory exploration of enthusiastic dialogue. These collaborations can transform our teaching in ways that merge our efforts and leave collective imprints of influence as we walk alongside positive, uplifting others. More often than not, we find that our influence is multiplied and even changed by this collective experience along the way. 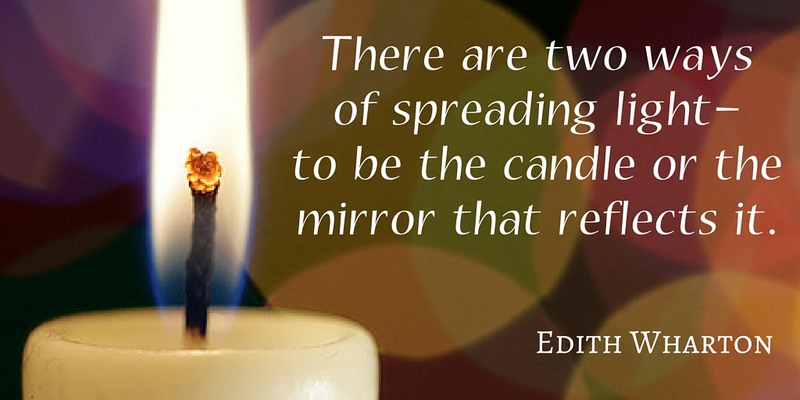 Thoughtfully reflective joint ventures can be a powerful meeting of influential minds. 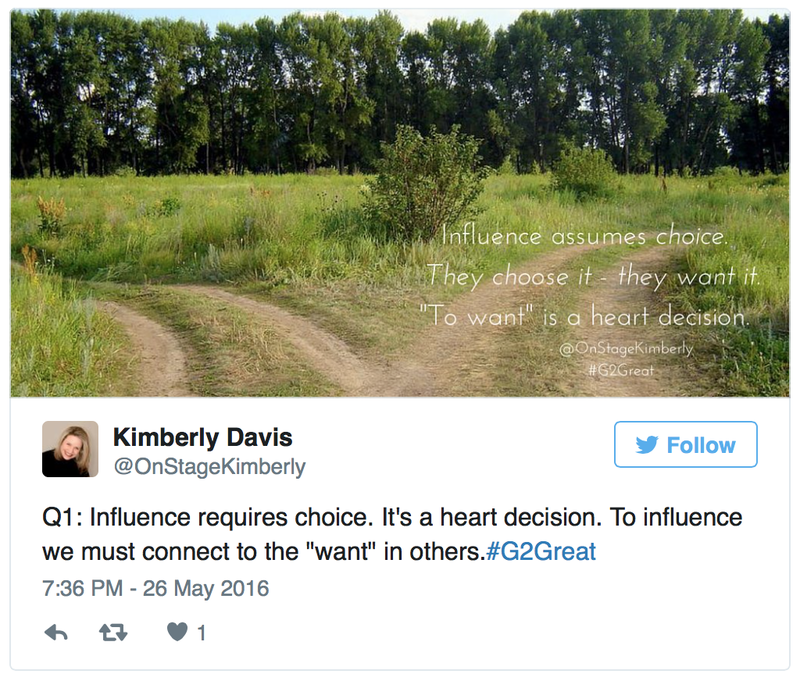 Kimberly’s tweet is a reminder that each of us hold the power of influence in our hands. Force and coercion seem to be commonplace in schools of today, but we cannot allow this to sap our energy and blind us to our influence potential. In spite of the popular but ever so flawed notion that we can force influence upon others through compliance, influence will occur only when we assume personal and professional responsibility awakened by our commitment and dedication to our profession. Influence is not an act of being, but a lifelong process of becoming. The good news is that no one can rob us of our influence potential unless we allow them to do so. We all hold in our hands the potential to influence others and leave a lasting imprint. Teachers have always had the ability to positively impact others, even when it may not feel that way. As I ponder Kimberly’s points, I am in awe of the immense potential that each of us have to be influential. You don’t have to write a book, stand on a stage, or have power to be influential (in fact some do those things without being influential). Your book is the book you write as you gaze into the faces of hopeful learners. Your stage is the stage you stand on each day to elevate the learning lives of students. Your power is the quiet impact you have on your own practices when you seek to understand and enrich your work day after day. Each of us leave imprints of influence every day – even when we are not yet privy to that influence at the time. Never underestimate your influence on others and those they in turn influence, knowing that we can’t be influenced unless we are willing to be influential. This is a ‘heart decision’ we make out of deep commitment and dedication to our work and our responsibility to do that work in the most effective ways. Will you join me friends? 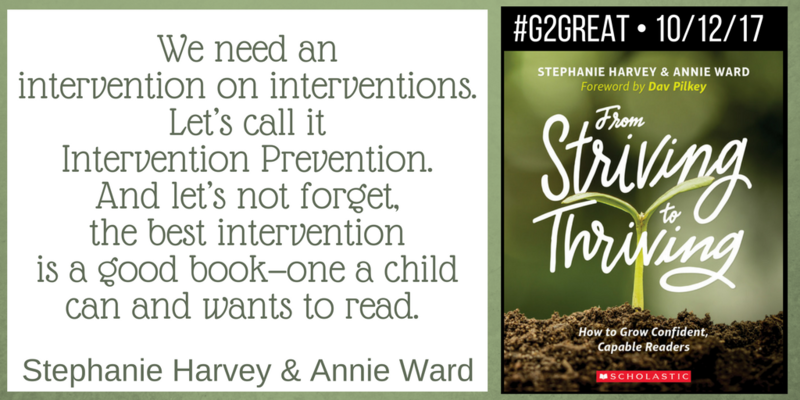 By, Jenn Hayhurst On Thursday March 3, 2016 #G2Great hosted a chat that began a conversation about the importance of independent reading. 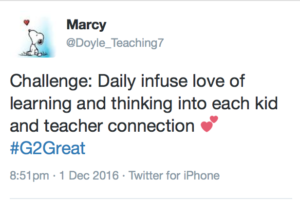 This blog post is dedicated to anyone who is “holding tight” to this work, either at home or in the classroom. It is for those of us who believe that literacy reveals a path of growth and self discovery through text. The following Saturday morning, I was part of an incredible team of teachers from my district, @SCCentralSD . We went to an event sponsored by a local organization called @TheBookFairies. 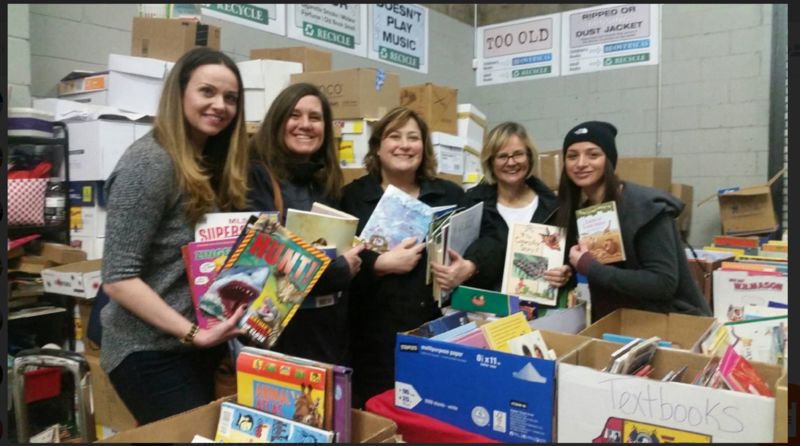 This amazing nonprofit opened their doors to teachers everywhere and we were able to shop for free books! It was quite a sight seeing everyone loading books into boxes, crates and bags. One teacher could barely close her trunk for all the books she and her colleague were taking back to school. We need to share our stories about the lengths teachers will go to promote literacy. We need to encourage our students to become connected so that they can share their love for independent reading. When we work together, we are creating a community with a purpose for reading. We are being the change we hope to see in education. Literacy changes lives. Our dedication and generosity to that effort is the flip side of the urgency we all feel. For these reasons, teachers are opening up their classroom libraries and giving free access to books because that’s one way to keep students at the center of all that we do. Our message is clear. We understand that now more than ever we need to “hold tight” to independent reading. 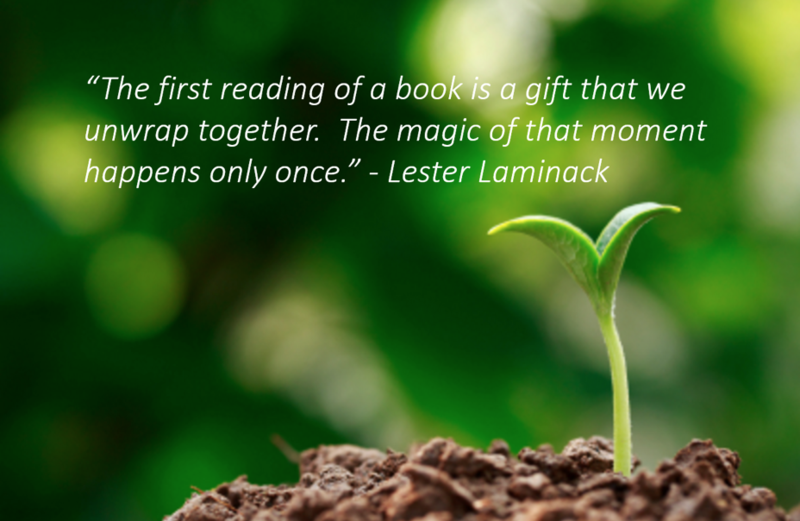 Think of a classroom library as a garden, and every book a child reads is like a seed. Narratives and informational texts take root and grow to fill students’ heads with stories and ideas. This becomes our context to teach children how to read. But even more than that, we are growing a love for literacy that will last a lifetime. Teachers are living in a high tech, data driven, standards based world. Rigor and grit are expected from students and there is no time to waste. Should teachers squander precious minutes of the school day merely reading aloud to students? After all, what would students actually be doing while a teacher reads aloud? Besides, we have computer based programs that read to students, so teachers can use that time in more productive ways. Right? No that’s just scary! 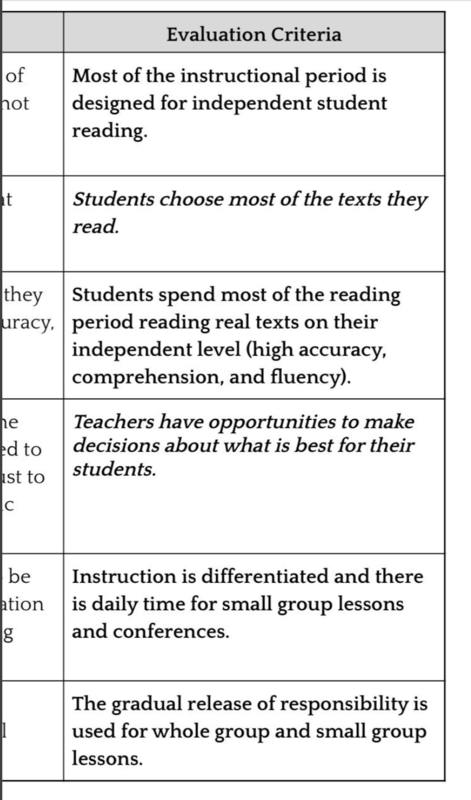 There are those who believe the best way to support standards, rigor, and grit is to devote time that might be spent on read aloud to other pursuits. 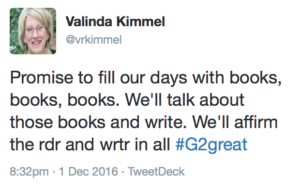 I couldn’t help but feel elated as I read the Storify from the February 4th #G2Great Chat, Holding Tight to Practices That Matter: Read Aloud. Educators from all walks of life were extolling the value of reading aloud. Teachers shared links, books, and ways to support the work with gusto. Why would they do that? The only reason I can think of is that teachers are remarkable, unselfish professionals who are motivated by improving the lives of students. We are working to safeguard the practices that matter most because they have the greatest impact for student achievement. Building a community around literature is one way to ensure that we build both community and critical thinking skills. It seems simple but it’s true that everything begins with a great book. To that end, there were so many great books that were shared and will, with a little faith, find great homes in classrooms everywhere. Mary compiled a list of your recommendations and created a fabulous resource to share ( just click here ) with everyone. I am not immune to buying more books than I can scarcely afford. 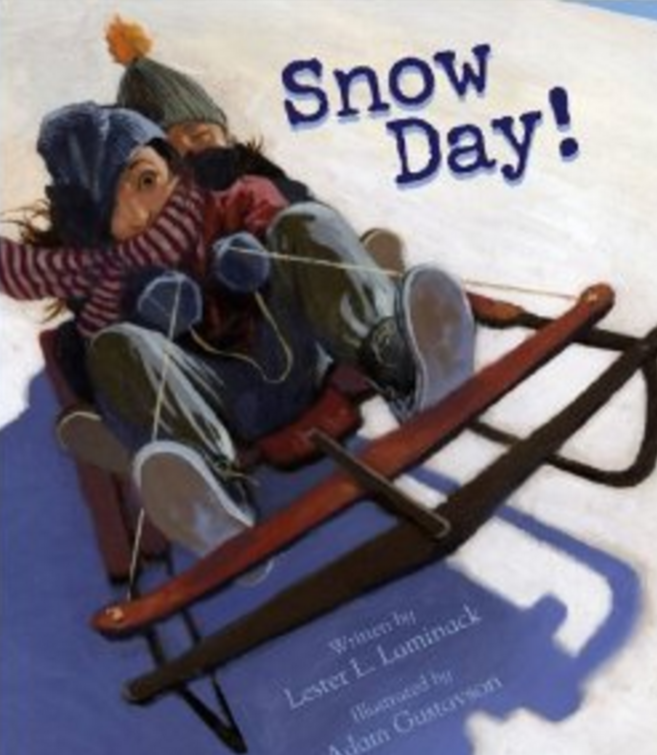 I just bought Lester Laminack’s Snow Day! It’s a wonderful book and I can’t wait to share it with students. 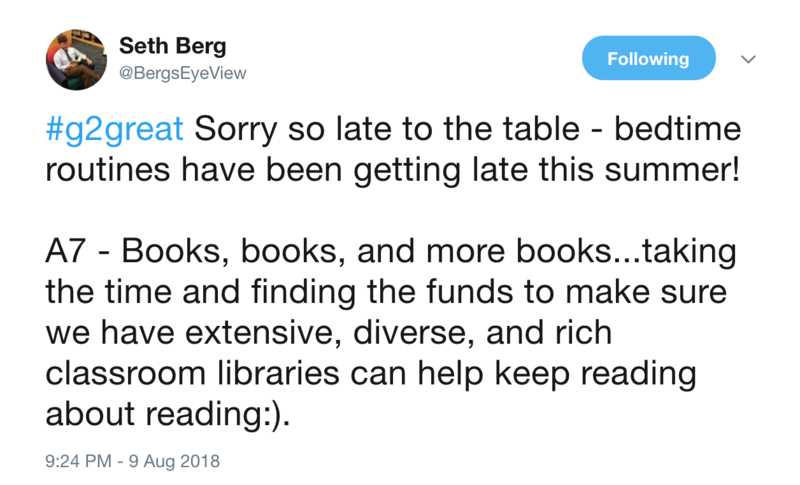 I wonder what books will be bought or borrowed because of last Thursday’s chat? How will this chat impact the work that happens with students? We constantly inspire each other to be the best teachers we can be because each day we spend with students is precious and we don’t have time to waste. 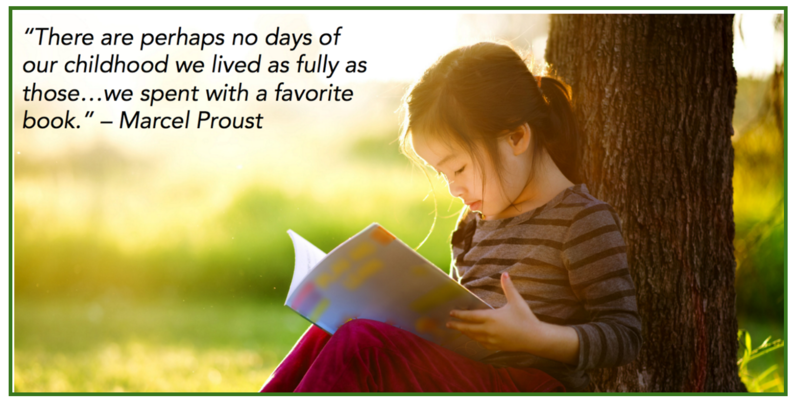 There is no question in my mind that the precious minutes we invest in read-aloud is time well spent.